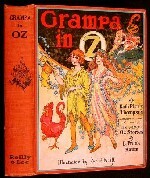 Lyman Frank Baum (1856-1919) was a sickly child with a heart problem and a huge imagination. While he suffered during his short stint at military school, he excelled at independent creative projects like creating his own newspapers, the first of which he called The Rose Lawn Home Journal. Over the course of his life he created many such small papers and failed at as many small business ventures. In 1882 he married Maud, the daughter of noted feminist Matilda Joslyn Gage, and together they moved to the Dakota territory in 1888. His second book for children, Father Goose, His Book, was created with renowned illustrator W.W. Denslow in 1899, and became a bestseller. The Wonderful Wizard of Oz soon followed, but the partnership with Den didn't last. 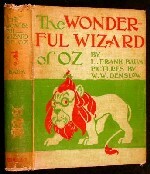 Although Baum might have preferred to vary his writings and to create American fairy tales, the incessant fan mail from children prompted him to pen 14 more books in the Oz series, all illustrated by John R. Neill. However, he also wrote things like Sky Island and a popular teenage girls' series called Aunt Jane’s Nieces (under the pseudonym Edith Van Dyne). At his death in 1919, Ruth Plumly Thompson (1891-1976) was named Royal Historian of Oz and continued the series. Most of our Baum fans are serious collectors of the original Reilly & Britton books. These books are both classic children's literature as well as treasures of American illustration. Mother Goose in Prose. Way & Williams, 1897. Illustrated by Maxfield Parrish. Father Goose, His Book. Geo. M. Hill, 1899. Illustrated by W. W. Denslow. Songs of Father Goose. Geo. M. Hill, 1900. Illustrated by W. W. Denslow. Dot and Tot of Merryland. Geo. M. Hill, 1901. Illustrated by W. W. Denslow. The Life and Adventures of Santa Claus. Bobbs-Merrill, 1902. Illustrated by Mary Cowles Clark. The Magical Monarch of Mo. Bobbs-Merrill Company, 1903. Illustrations by Frank Verbeck. Queen Zixi of Ix. The Century Company, 1905. Illustrations by Frederick Richardson. The Woggle-bug Book. Reilly & Britton, 1905. Illustrated by John R. Neill. John Dough and the Cherub. Reilly & Britton, 1906. Illustrated by John R. Neill. The Sea Fairies. Reilly & Britton, 1911. Illustrated by John R. Neill. Sky Island. Reilly & Britton, 1912. Illustrated by John R. Neill. Oz-Man Tales. 6 short Oz stories (~62 pp. ), Reilly & Lee, 1916-1920. Illustrated by John R. Neill. The Little Wizard Series. 6 short Oz stories (29 pp. ), Reilly & Britton, 1913. Illustrated by John R. Neill. 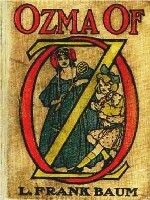 Ozma of Oz. Reilly & Britton, 1907. Illustrated by John R. Neill. Dorothy and the Wizard of Oz. Reilly & Britton, 1908. Illustrated by John R. Neill. The Road to Oz. Reilly & Britton, 1909. Illustrated by John R. Neill. The Emerald City of Oz. Reilly & Britton, 1910. Illustrated by John R. Neill. The Patchwork Girl of Oz. Reilly & Britton, 1913. Illustrated by John R. Neill. Tik-Tok of Oz. Reilly & Britton, 1914. Illustrated by John R. Neill. The Scarecrow of Oz. Reilly & Britton, 1915. Illustrated by John R. Neill. Rinkitink of Oz. Reilly & Britton, 1916. Illustrated by John R. Neill. The Lost Princess of Oz. Reilly & Britton, 1917. Illustrated by John R. Neill. The Tin Woodman of Oz. Reilly & Britton, 1918. Illustrated by John R. Neill. The Magic of Oz. Reilly & Lee, 1919. Illustrated by John R. Neill. Glinda of Oz. Reilly & Lee, 1920. Illustrated by John R. Neill. 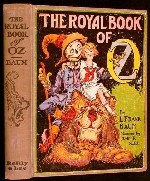 The Royal Book of Oz. Reilly & Lee, 1921. Illustrated by John R. Neill. 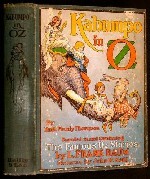 Kabumpo in Oz. Reilly & Lee, 1922. Illustrated by John R. Neill. The Cowardly Lion of Oz. Reilly & Lee, 1923. Illustrated by John R. Neill. Grampa in Oz. Reilly & Lee, 1924. Illustrated by John R. Neill. The Lost King of Oz. Reilly & Lee, 1925. Illustrated by John R. Neill. 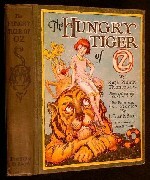 The Hungry Tiger of Oz. Reilly & Lee, 1926. Illustrated by John R. Neill. The Gnome King of Oz. Reilly & Lee, 1927. Illustrated by John R. Neill. The Giant Horse of Oz. Reilly & Lee, 1928. Illustrated by John R. Neill. Jack Pumpkinhead of Oz. Reilly & Lee, 1929. Illustrated by John R. Neill. The Yellow Knight of Oz. Reilly & Lee, 1930. Illustrated by John R. Neill. Pirates in Oz. Reilly & Lee, 1931. Illustrated by John R. Neill. The Purple Prince of Oz. Reilly & Lee, 1932. Illustrated by John R. Neill. Ojo in Oz. Reilly & Lee, 1933. Illustrated by John R. Neill. Speedy in Oz. Reilly & Lee, 1934. Illustrated by John R. Neill. The Wishing Horse of Oz. Reilly & Lee, 1935. Illustrated by John R. Neill. Captain Salt in Oz. Reilly & Lee, 1936. Illustrated by John R. Neill. Handy Mandy in Oz. Reilly & Lee, 1937. Illustrated by John R. Neill. 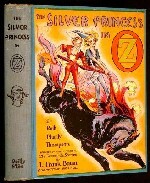 The Silver Princess in Oz. Reilly & Lee, 1938. Illustrated by John R. Neill. Ozoplaning with the Wizard of Oz. Reilly & Lee, 1939. Illustrated by John R. Neill. The Wonder City of Oz. Reilly & Lee, 1940. Illustrated by John R. Neill. 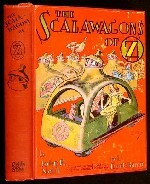 The Scalawagons of Oz. Reilly & Lee, 1941. Illustrated by John R. Neill. Lucky Bucky in Oz. Reilly & Lee, 1942. Illustrated by John R. Neill.